Pedestrians and shoppers may have noticed a van being pushed down Division Street yesterday – but it was far from a regular breakdown. The outreach vehicle used by the Sheffield Working Women’s Opportunities Project (SWWOP) since 2003 was in fact receiving a final send-off with help from employees of technology firm ARM Holdings. 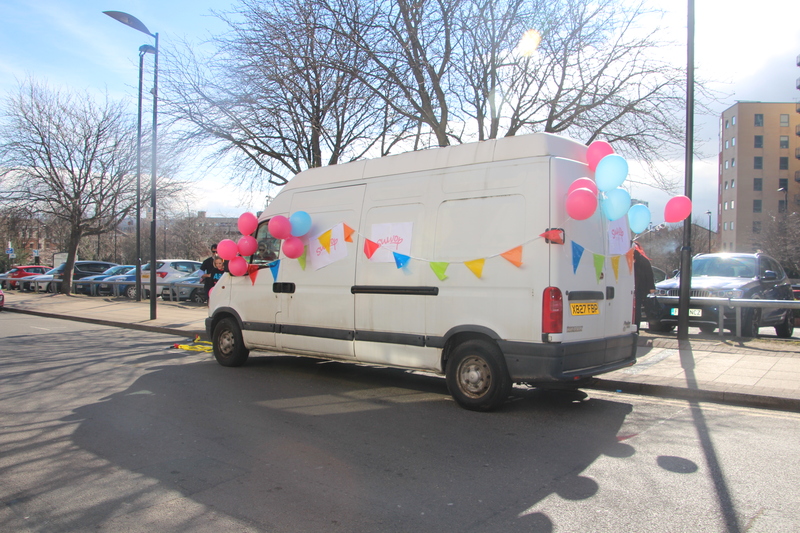 The company has donated £22,000 so the charity can replace the Renault Master it has used thousands of times to support local women involved in street prostitution. SWWOP staff and volunteers distribute free condoms, hot drinks and food and provide a satellite needle exchange to those in need from the customised van. It was beginning to show its age, so ARM’s Rockingham Street office stepped forward to contribute the money needed to buy a new vehicle, which will be modified to feature a sink, kettle and other equipment. Left to Right– Sali, Shelley, Simon (ARM), Stevie & Jill. 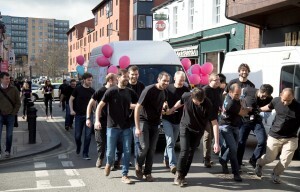 To celebrate the upgrade and raise awareness of SWWOP, the old van was led from the top of Division Street to Barker’s Pool while the Wicker-based charity held a bucket collection. Sali Harwood, Manager of SWWOP, said: “We are so grateful to ARM for their generous donation, which will help us to continue making a huge difference to vulnerable women on our streets. SWWOP has been operating for more than 20 years and works with the council and the police to help lead women out of prostitution. Last November, it reported it had come into contact with 51 ‘new’ women between June and August 2016 – an increase Sali described as “massive”. Sali added: “Many women intend to work on the streets for just a few weeks, but we find that once they are involved, it can be difficult for them to get out. Simon Humphrey, Corporate Responsibility Manager at ARM Holdings, said: “It is fantastic to be able to help such a great charity and make a big difference to real people’s lives. SWWOP accepts donations via a JustGiving page. Just £1 is enough to provide breakfast for one of our clients, while £5 can provide sandwiches for two outreach sessions, or £40 can cover the fuel needed for six. For more information on SWWOP or to donate, visit www.swwop.org.